So little Bobby has been sneezing and coughing. He seems to have the common cold. Your first thought is to bring him in to the doctor. The doctor prescribes fluids, rest, and a follow up if symptoms persist. You ask, what about a prescription for antibiotics? The doctor hesitates: “It is likely viral, antibiotics would not help”. You insist. At the request of Doctor Musoff, we are going to discuss the overuse of antibiotics. Many patients come into the urgent care and insist on receiving antibiotics despite counseling from the physician that they do not need it. We hear about it throughout everyday life, everyone’s first thought when they get sick is to start antibiotics. Many do not know that antibiotics fight against bacteria, but have NO effect on viruses. As the Doctor says, many times antibiotics are not needed, they are costly, have side effects, and can become harmful. Antibiotics are vital solutions for many serious infections. When taken properly they can and will save lives threatened by bacterial infections. However, taking antibiotics when we do not need them poses many risks. The misuse of antibiotics will lead to antibiotic resistance. If the doctor does not recommend antibiotics, one should not insist for a prescription. Bacteria reproduce and will adapt to the overuse of commonly used antibiotics. Their adaptive ability will become detrimental to our health. Once they become resistant to the commonly utilized antibiotics, new antibiotics will have to be developed and the ones that are currently effective that we are all familiar with, for example, Azithromycin, will lose their effectiveness. According to the Effective Diseases Society of America, the misuse of antibiotics has and will continue to lead to hospital acquired infectious diseases that are resistant to the standard antibiotics in use today. Trust the doctor’s judgment. If your symptoms persist, go right back to the doctor for further evaluation. 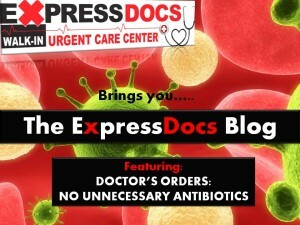 ExpressDocs Urgent Care Center is staffed with quality board certified physicians. Walk-in anytime during operating hours for quick, affordable, quality medical care.